Barium In My Water?! | What are you REALLY drinking? What’s happening in our watersheds? A watershed is an area of land where all the water that is under it or drains off from other places goes. A watershed can be made up of a variety of habitats including wetlands, forests, creeks, rivers, etc. These wetlands help protect our water sources as they store, filter and discharge any runoff. They also control the amount of pollution in our water, prevent flooding, and help to protect biodiversity (“What is a Watershed?”, n.d.). – Runoff from parking lots where pollutants such as car oil or gasoline, is carried off into streams and waterways. -Acid rain, a phenomenon caused by many human activities including burning fossil fuels, falls into and acidifies waterways (“Protecting Water from Non-Point Source Pollution”, 2002). -Pollutants from the drains (shampoos, soaps, etc) gets into the waterways and end up in the watershed. -Usage of fertilizer releases and adds ions, such as nitrogen, into the watershed, when it otherwise wouldn’t be there. -Urban development also blocks the natural flow of watersheds. -Roadways can also cause trouble by giving water a “fast lane” to streams, leading to potential flooding (How Stuff Works, n.d.). Basic Information about Barium in Drinking Water. (2013, September 17). Retrieved January 7, 2014. Choudhury, H. World Health Organization, (2001).Barium and barium compounds. Helmenstine, A. (2014, November 27). What is alum?. Manitoba Water Stewardship , (2010). Barium in manitoba well water. Marsh. J.H..R. The Canadian Encyclopedia. (2013). Toronto feature: r.c. harris water treatment plant. Retrieved January 12, 2015 From http://www.thecanadianencyclopedia.ca/en/article/toronto-feature-rc-harris-water-treatment-plant/. Northwest Territories Drinking Water Quality Database. (2008, September 12). Retrieved January 7, 2015. Organic Matter and Barium Absorption by Plant Species Grown in an Area Polluted with Scrap Metal Residue. (2012). Applied and Environmental Soil Science,2012(476821), 7-7. Patel, S. (2014, May 28). Water contaminant: Barium. What is activated charcoal and why is it used in filters?” 01 April 2000. HowStuffWorks.com. <http://science.howstuffworks.com/environmental/energy/question209.htm&gt; 13 January 2015. 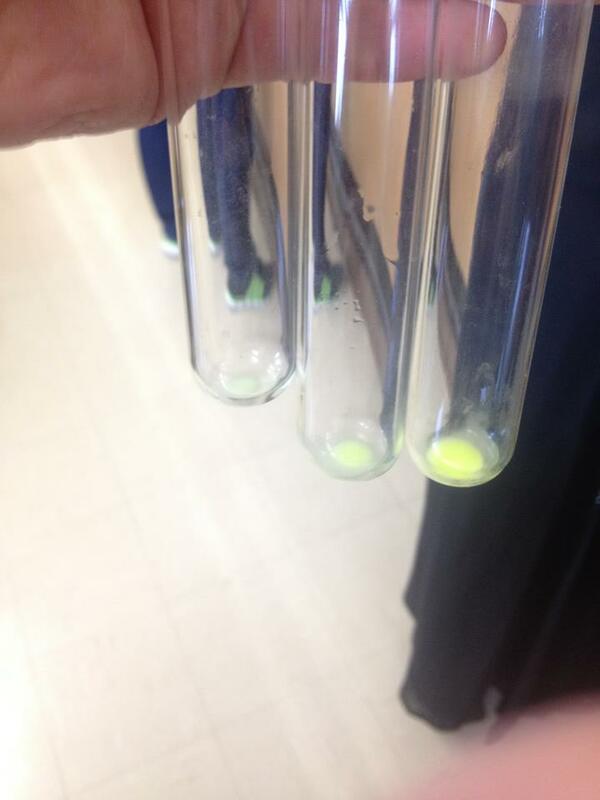 In our assignment, we were given a sample of water with two possible contaminants; Silver (Ag+) or Barium (Ba2+). To tackle the situation, we made a plan! We first decided to extract any silver ions in the sample using acetate (C2H3O2). 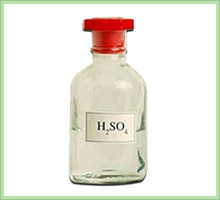 If there had been any silver in the water, the resulting precipitate would have been AgC2H3O2, or silver acetate. In our specific case, there were no silver ions in the water, thus no silver acetate was produced. Afterwards, we still had to face the possibility of barium contaminating our water sample. 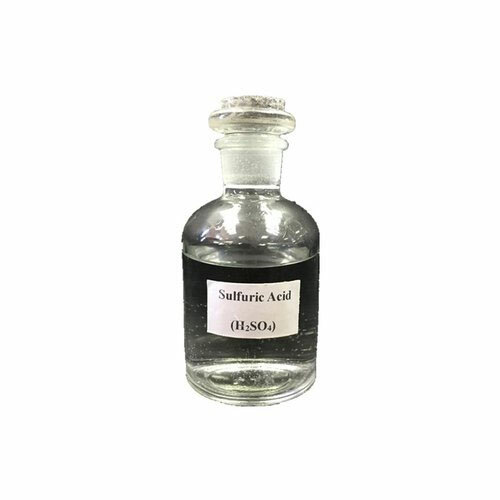 We chose sulfuric acid to precipitate out any barium ions. Eureka! 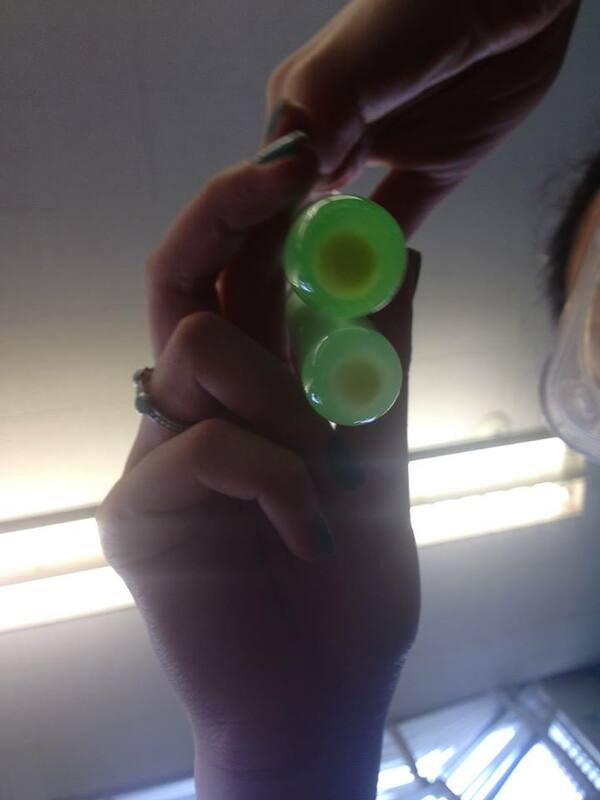 Our solution instantly produced a precipitate, which we knew to be barium sulfate (BaSO4). After determining which ions were present in our sample, we could continue on with the rest of the experiment: testing our homemade filter. 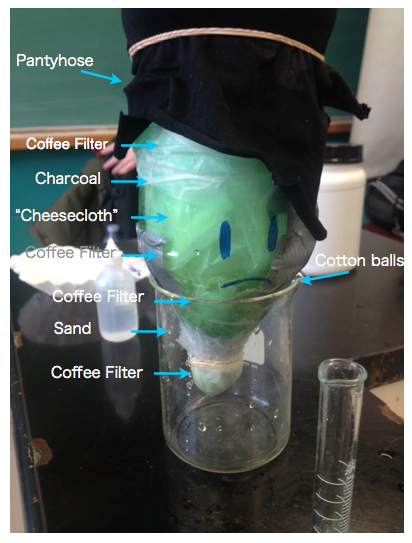 activated charcoal, coffee filters, an old pantyhose and sand. Other materials include a 2L plastic bottle, rubber bands, duct tape, clear tape and a beaker. In this filter, most of the layers focused on cleansing the water of any ‘large’ particles that may interfere with the reactions while the activated charcoal and sand focused on removing the ions and small particles. Activated charcoal is treated with oxygen to help open up millions of tiny pores between the carbon atoms. This tiny pores adsorb/ attaches itself to other impurities (usually ‘organic’ chemicals) and filter them out (“What is activated charcoal and why is it used in filters?”, 2000). Sand is also frequently used to remove suspended solids from water (“Sand filtration”, n.d.). The test-tube on top is the control. added 25 drops of acid post-filtration. After both precipitates had settled to the bottom, it was evident that our first trial had less precipitate than our control. To make sure it wasn’t a fluke, we repeated the process once more. For our second trial, we first replaced the coffee filters at the very bottom and just above the charcoal to the filter to ensure optimal filtration. We repeated the steps, with 25 ml of solution and 25 drops. It yielded the same observation and we could now be certain of our filter’s ability to filter out barium ions! 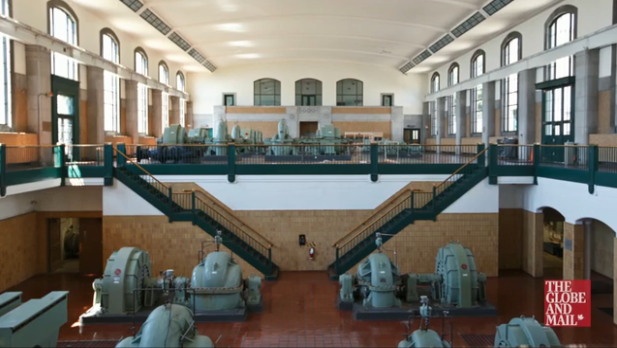 An inside look into North York’s main water plant: the R.C. Harris Water Treatment plant. Wastewater is a (pretty gross) mixture of liquids and solids that residents, businesses and institutions such as schools, flush down the toilets and pour down sinks and drains daily. The slushy mix then travels down the sewer system to one of four wastewater treatment plants in Toronto; The Ashbridges Bay, Highland Creek, Humber or North Toronto wastewater treatment plant (“Wastewater – Water – Services | City of Toronto”, 2014). Before the actual treatment, the wastewater is passed through a bar screen (a screen with large vertical metal rods) to catch any large objects such as sticks or rocks. After the bar screen, the wastewater is slowed down before entering the grit tank, to give sand, gravel or any other heavy material the chance to settle to the bottom of the tank. All of these objects/debris is sent to the landfill (“Wastewater – Water – Services | City of Toronto”, 2014). The first ‘treatment’ lets the wastewater sit in settling tank for several hours where eventually the solid particles will sink to the bottom. 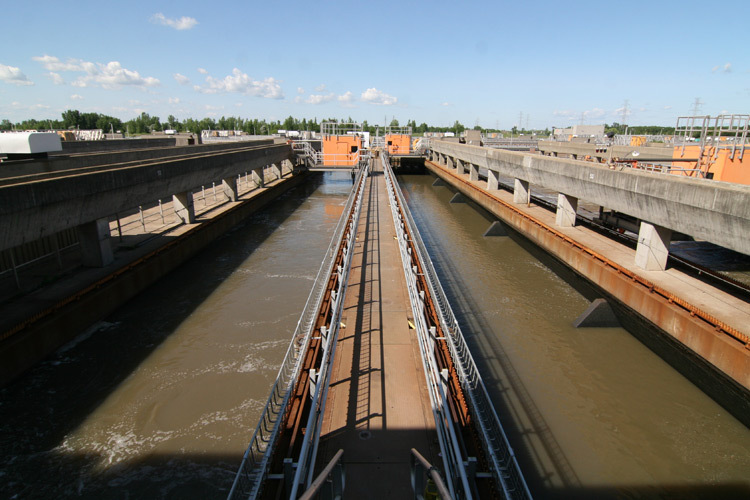 In the second treatment, a biological process of using micro-organisms helped to clean up the water. Oxygen is added to the water to provide a place for the micro-organisms to grow, these organisms later eat any small bit of organic material/waste (“What happens when I flush?”, 2014)- it’s as if they’re doing all the work for us in this stage! The water is later sent to a ‘clarifier’ where the organisms will settle to the bottom. 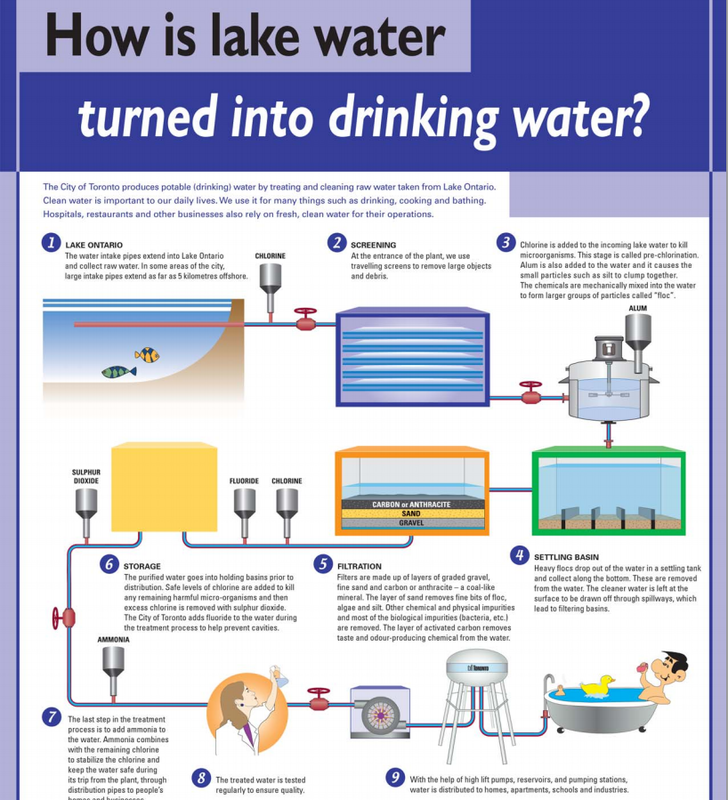 When both stages are complete, the water is disinfected with chlorine to be sure any harmful is gone before being released back into Lake Ontario (“Wastewater – Water – Services | City of Toronto”, 2014). – The secondary treatment, the process using the organisms + machinery, must remove at least 95 percent of pollutants (James, 2013). First, raw water is taken from Lake Ontario using large pipes in one of the four treatment plants in Ontario; The R.C Harris, the F.J Horgan, Island or R.L Clark Water Treatment Plants. Once the water enters the plant, screens are used to remove large objects and debris, and pre-chlorination happens; a process where chlorine is added to kill any micro-organisms (“Drinking water treatment,” 2015). Alum, a chemical compound (Helmenstine, 2014), is also added at this point and causes small contaminates such as silt to clump together (“Drinking water treatment,” 2015). The chemicals are then mechanically mixed with the water and form larger groups of particles called “floc”. In a large tank, the heavy floc sinks to the bottom and is later on removed by being passed through several filters made of layers of gravel, fine sand and carbon or anthracite, a coal like mineral (“Drinking water treatment,” 2015). If there were any previous chemical, physical or biological impurities in the water, the filters would catch those, and the carbon layer has it’s own job of eliminating any taste or odour-producing chemicals as well. After being purified, the water will flow into holding basins before being distributed to North York citizens/ Torontonians. A safe level of chlorine is added to kill any micro-organisms left and excess chlorine is removed using sulphur dioxide. The City of Toronto also adds fluoride to water to help combat cavities (“Drinking water treatment”, 2015). Finally, the plant adds ammonia to the water to stabilize any chlorine in the water and protect the water during it’s long journey from the plant to people’s taps (“Water treatment program,” 2014). The population of North York, along with other cities in Ontario, get their water from Lake Ontario (“Drinking water treatment,” 2015). Before any water can be consumed, it is first treated at water treatment plants spread throughout the city; plants include the R.C. Harris, F.J. Horgan, R.L. Clark, and Island, but the main water treatment plant that provides York Region’s population with clean and safe drinking water is the R.C. Harris water treatment plant. The R.C Harris plant can be found at the foot of Victoria Park Ave (Marsh, n.d.).